The importance of oil to recent economic performance in North Dakota is well-documented. As the biennial legislative session gets underway the price declines of the last several months are likely on everyone’s mind, and rightly so. This Wall Street Journal article details the difficult decisions facing oil companies in the relatively near future as far as capital spending, dividends, and other expenditures are concerned. This New York Times article discusses the scaling back in rigs across the country due to lower oil prices. 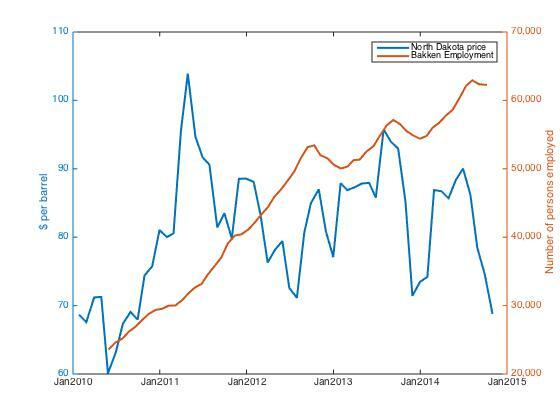 Clearly lower oil prices are likely to impact North Dakota, but by how much? Part of the problem encountered when tackling this question in the availability of data. We do not have long price series for oil from North Dakota. Fortunately for us the U.S. benchmark, West Texas Intermediate crude has a price correlated highly with the available North Dakota prices. For our purposes we can use them as substitutes. A few things to note here. 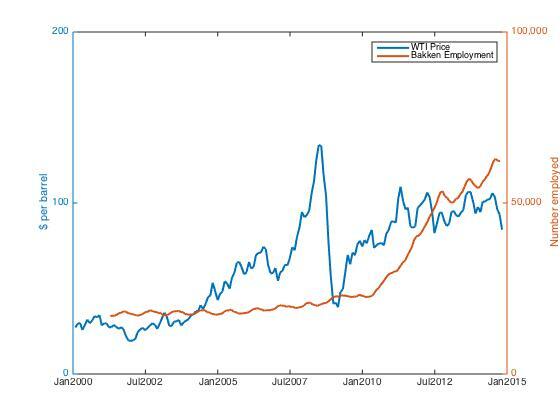 It is not clear that there is any relationship between the price and the employment series. The problem? The series starts after the oil boom really takes off and so there are threshold effects that may need to be considered. Oil prices were already passed the level the tripped a takeoff in the local economy. This is where the WTI price series comes in. Recall I mentioned the high degree of correlation between WTI price and ND price. That high degree of correlation allows us to go further back in time and come up with an approximation of what happened. The graph above goes back to January of 2000, getting us to a point before the oil takeoff in North Dakota. However, as the price rises, towards the end of the series, we do start to see an increase in employment from the core Bakken counties (Dunn, McKenzie, Mountrail, and Williams). Now I have not actually answered the questions at hand. What is likely to happen as a result of the oil price decline? Could the price decline be beneficial in some ways? These are questions students asked me at the end of last year, and I have been thinking about them. In future posts I will discuss some of the statistical analysis done to come up with an estimate of the possible changes and what might happen as a result.